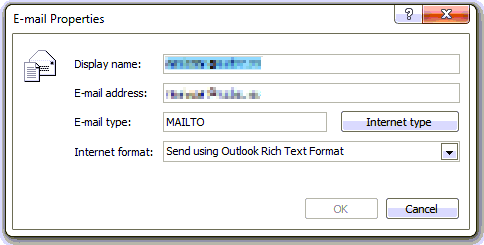 Outlook: Your message did not reach some or all of the intended recipients. You’re my hero, had this exact problem on Tuesday! Thanks for the suggestion. I had to delete my contact entry for the person and remake it (even though it had worked for a year) it must’ve been some kind of corruption. I noticed when I opened the contact entry to edit it it was also giving me another error about loading the contacts, but once I deleted this one contact and remade it my contact list was working properly again for everyone. Go to >>>>> tools > Account settings > then double click on the email address > then click on More settings > click Outgoing server tap > then check the box “My Outgoing server (SMTP) … and leave the options the same as is and press OK. Please when it is work pray for me or say GOD PLEAS YOU. Thanks for the brief descriptive solution.It worked like a charm. I had this problem but it’s work thanks to you. But I think that I can’t receive emails from the contact that I had problem with. so how can I make sure that if he send me email I will receive it?? I had this problem but its work thanks to you. But I think that I can’t receive emails from the contact that I had problem with. so how can I make sure that if he send me email I will receive it?? I had a problem where I could not send to people I had been sending to for years. My solution was to delete my outlook cache and then find an email of theirs and reply to it. Then everything worked great. God bless you Bilal Al khayyat. It worked for me too. Thank you very much.